If you regularly enjoy the spare time through kayaking or fishing with a kayak, you don’t know when the rain comes or when the waves splash some water onto the floor. You would think you just need a bucket to remove these waters from the deck. But the question is how perfectly a bucket can remove these excess waters. On the other hand, spending time through these excess waters decrease the comfortability and that’s why you need a perfect solution to dry out the deck or floor. And literally this is why you need a bilge pump to quickly clean out the floor. A bilge pump comes with the ability to remove gallons and gallons of water. Moreover, it would be a hassle free job and you just need to spend your simple effort. So here is a guideline that would help you to choose the right bilge pump you need for your vessel. 4 Has It Leak Proof Body? 5 Is it easy to mount? All the bilge pumps are not same, there are different designs and types. But the manual and electric bilge pumps are most popular for their excellent capability. 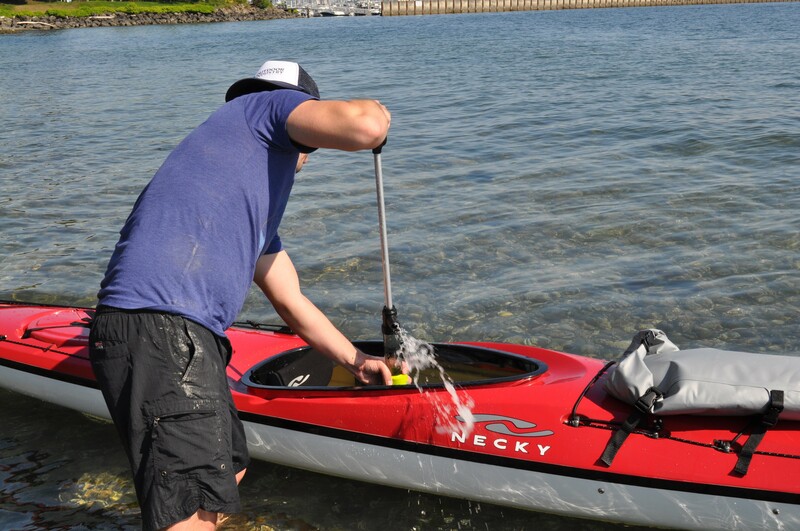 Manual Bilge Pumps: The manual bilge pumps are simple and everything you have to do manually to remove the water elsewhere from your kayak. Either these pumps would feature a hose or sometimes not. But you can adjust a hose additionally into the valve to comfortably remove the water. All you need to place the pump over the floor and push the handle to remove the excess water. These pumps are handy and can easily reach on the tough areas to take the water. Electric Bilge Pumps: you have to mount these bilge pumps over the kayak’s floor and it can be operated by a battery you use in your vessel. Although you have to set up the hose such a way as if the water simply goes away when you start up the pump. So when you will start up the pump, it will quickly start removing the water. For this purpose you can adjust a switch. But amazingly there also you can get the automatic electric bilge pump, that will be automatically started up after getting any availability of water in the floor. Although the manual bilge pump can be made with a plastic body and that’s why the rust is no longer to damage it. But the electric bilge pumps are mostly made with metal body and that’s why there can have the chance to be damaged by water. But if you choose the rust resistant stainless steel or aluminum based hull, then there is a minor chance to be corroded. If you skip this requirement and don’t choose a rust resistant bilge pump, then it would be no longer to provide service at least for one year. The question comes how many gallons of water the pump can drain out in every hour. Unfortunately, most of the manufactures lie in this case. Although most of the times the manual bilge pumps don’t promise like an electric bilge pump. Because it depends on your effort, but it is possible to drain out 4 gallons of water by a manual pump while the electric pumps would promise like it can drain out 500 gallons of excess water in every hour. But if it can drain out at least 250+ gallons of water in real time, then that is great. Has It Leak Proof Body? Mostly happening in manual bilge pumps, it can be leaked for the weakness in its functions. That’s why some manufactures design leak proof body that at least can be survived for a year. Literally, if a pump leak, then it almost loses its value and in this case it is difficult to recover. So you should pick a bilge pump that comes with a leak proof body. Is it easy to mount? Although the manual bilge pumps will be controlled manually and don’t need to be mounted. But the electric bilge pumps should be mounted on the kayak’s floor to be operated. That’s why you must notice over the mounting system that offers the pump. Although you can find some DIY methods on Youtube to mount a bilge pump and here we attached a helpful video!